Twin Cities FRSO celebrates International Workers Day 2018 | Fight Back! 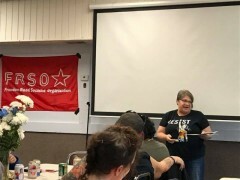 Minneapolis, MN - Over 125 people gathered together for the Twin Cities Freedom Road Socialist Organization’s annual International Worker’s Day program, April 28. The night started with dinner and conversation. Childcare was provided. Event Emcee Tracy Molm invited attendees to become an FRSO Twin Cities general members. This May 1 marks the first-year anniversary of the revived general membership program, which has seen much success. In fact, many new general members were in attendance celebrating International Workers Day. The “Year in Struggle” slideshow was full of highlights from the big fights of the past year. Also, an “In Memoriam” slideshow featured both international, national, and local working-class fighters such as Winnie Madikizela-Mandela, Dennis Banks, and Tyrone Rashad Williams who passed away during this past year. The program also included: Angel Buechner of the Twin Cities Coalition for Justice for Jamar, along with leaders of the anti-war, student, and immigrant rights movements. A highlight of the program included video salutations from striking workers across the country, including teachers, miners and others. The night concluded with the singing of The Internationale.